Thank you for your interest in King's ECO Plastics. We are highly proud of the reputation we have earned in the plastic injection molding industry: A reputation of strong customer focus and high-quality, just-in-time, precision parts manufacturing. Call us to discuss the details of your plastic parts and project requirements. With over 30 years of experience in building precision molds, we have the skills required to meet the most exacting of standards and look forward to hearing from you. Our Customer Service team is available from 8:00 am to 5:00 pm CST Monday through Friday to kindly assist you. KING’S ECO PLASTICS is based in McAllen, Texas in close proximity to many Mexican leading multinational companies and contract manufacturers. Our 40,000 sq. ft. manufacturing and warehousing facility, which also houses our very own tool repair shop, is conveniently located 5 minutes from Interstate 83. 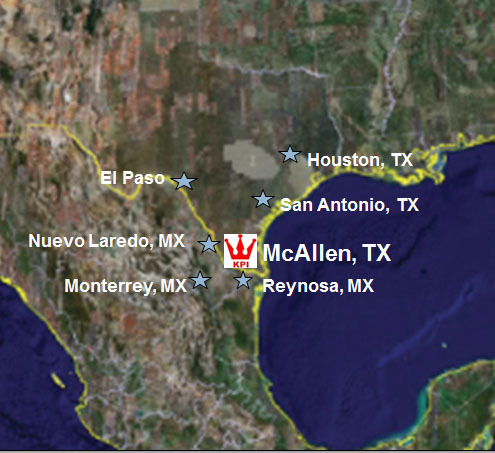 In addition, we are minutes away from the Anzalduas Bridge to Mexico, allowing for timely delivery of components, and only 10 minutes from the McAllen/Miller International Airport (MFE). King’s ECO Plastics, LLC respects your privacy and the purpose for which our site visitors provide us information.